Form Description: Let�s face facts, children are rather rambunctious and can sometimes need a little discipline. This is true whether you are teaching them in a traditional school setting, or are going the homeschooling route. Utilize this Discipline Log Form to help you keep track of who acts up in class, what they did, how you punished them, and any additional notes you feel are necessary. Definitely a huge help when you are trying to create an new educational plan that will be more effective for the student. 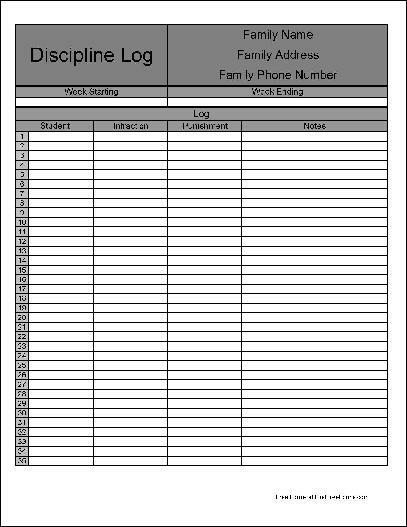 Show some pride in your family with this particular edition of the Discipline Log Form. It has been formatted to allow you the option of personalizing it. What better way to show your family that you are proud of them in all that they do than by using personalized letterhead whenever possible? This particular edition of the Discipline Log Form has been specially formatted with numbered rows. These numbered rows will allow you and your family an easier time of referencing a particular charge that is listed. Which can be particularly confusing when you have a lot of information to sort through. This form ("Personalized Numbered Row Discipline Log Form") is associated with the following keywords: Education, homeschool, discipline, disruption, punishment, log, personalized, numbered row.